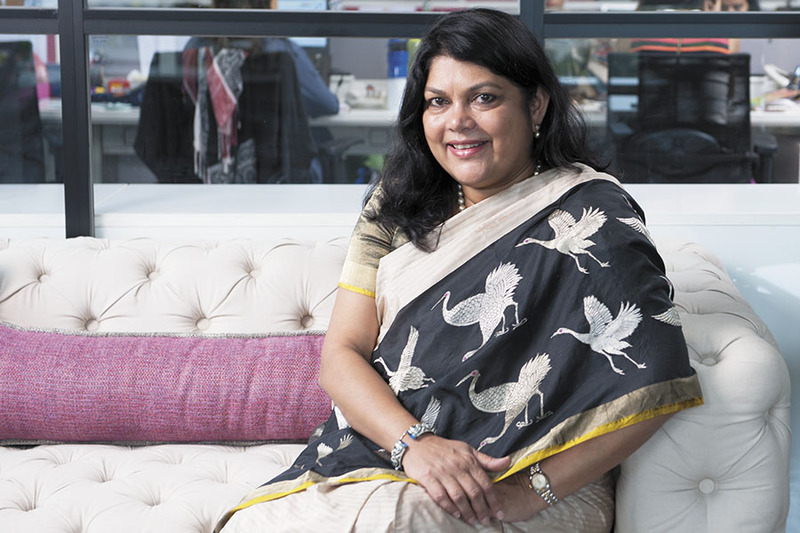 The investment banker-turned-businesswoman founded Nykaa in April 2012 to fill what she says was a “huge gap”—the lack of online cosmetics retailers—in the Indian market. The “long tail” nature of the beauty business—a vast variety of products need to be stocked to cater to varied preferences—has always been a pain point for brick-and-mortar retail. Ecommerce allows a retailer to stock a wide range of products, and get wider access to consumers. Plus the digital marketing revolution has fast caught on in India. “That’s how the Nykaa brand got built online,” says Nayar, citing Sephora, the multi-brand cosmetics retailer owned by French luxury goods giant LVMH, as an inspiration. Over a patchy telephone line from London, where she is holidaying, Nayar recalls a conversation with a top management executive of Adidas in India during the early days of Nykaa. “He told me he had 1,000 stores across India, and every store saw 50 footfalls, so he had 50,000 visitors a day. Nykaa was a small website at that time, and still we had 100,000 visitors a day. The power of digital is immense,” she stresses. Today, Nykaa offers 60,000 products—Indian and international, luxury and mass market—from more than 650 brands, and attracts 50 million visitors a month, while fulfilling 10,000-15,000 orders a day. In 2015, it ventured into offline retail, with the opening of five Nykaa Luxe stores in Mumbai, Delhi and Bengaluru. Nayar, 54, was a force in the finance world before she decided to strike out on her own. She worked at Kotak Mahindra Capital for 18 years—running their mergers and acquisitions business, and setting up their international operations in London and New York before retiring as managing director and head of the institutional equities business. Naysayers were aplenty when she decided to set up Nykaa, but the entrepreneurial urge in her was too strong to resist. “I met a lot of entrepreneurs in my career as an investment banker. Their beliefs in what they were creating and their aspirations motivated me to do something like that for myself,” says the graduate from IIM Ahmedabad, who met her husband, KKR India CEO Sanjay Nayar, while in college. “Nykaa is in a very good segment,” says Arvind Singhal, chairman of research firm Technopak. Personal care, he says, is growing rapidly, as it moves beyond the upper middle class to the middle class. 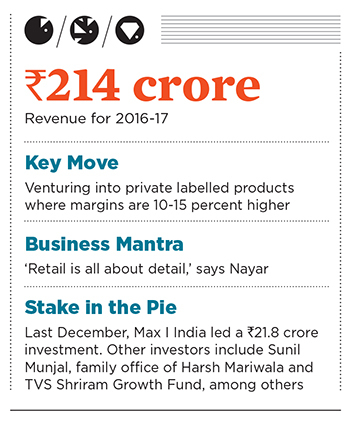 Investors appear to agree: Nykaa raised ₹104.3 crore last year from a clutch of influential investors, including Max I India (a subsidiary of Max Ventures), Hero Group’s Sunil Munjal, and the family office of Marico founder Harsh Mariwala among others. Since 2014, Nykaa has received a total of ₹185 crore in funding from various investors. This investor confidence comes from Nykaa’s strong “growth engines”, as Rishabh Mariwala—he oversees his family office’s investments and has a startup—puts it; he counts Nykaa’s online portal, its private labelled products (that it started in 2015), and its stores as drivers of growth. They have helped power Nykaa through the last year-and-a-half, during which the ecommerce sector was reeling from the aftereffects of sky-high valuations accorded to startups. It posted revenues of ₹214 crore in FY17 and is on track to achieve positive Ebitda by the end of the year, says Nayar. Although it is a multi-brand retailer, Nykaa introduced its private label of nail enamels in 2015, followed by the launch of competitively priced lipsticks, kajal sticks and body mists. Nayar says private labelled products, where margins are 10-15 percent higher, are expected to contribute 20 percent to total sales in the future. As part of its multi-brand strategy, Nykaa struck a deal with Estée Lauder last year to sell its premium brands MAC, Clinique and Bobbi Brown online in India for the first time. The partnership worked, boosting Nykaa’s sales in the luxury segment that now contributes 15 percent to overall sales. Critical to Nykaa’s strategy is its omni-channel presence. It plans to open another 10 stores by the end of this fiscal, and a total of 30 by 2020. In addition to Nykaa Luxe—stores that stock an assortment of luxury labels—there will be ‘Nykaa on Trend’ stores, which will stock bestsellers from its ecommerce platform. “We’ll leverage the data and insights we have to stock the right products,” explains Nayar. Moreover, by curating beauty products and providing customers with rich content—make-up tutorials, reviews and recommendations on its blog and YouTube channel—Nykaa has created a sticky, engaged community of users—a key moat in the cut-throat discount-based world of ecommerce. While horizontal marketplaces like Amazon and Flipkart don’t have the range that Nykaa does, ecommerce portals like Purplle focus solely on beauty products. Yet, Nayar doesn’t consider them to be competition. “In the art of selling, Nykaa delivers,” she asserts. While the business of beauty will always remain big, can Nykaa grab a share of the market? Nayar is certain it will.